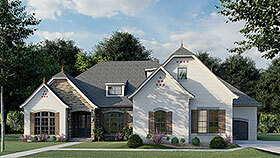 Charming shutters, mixed stone and brick siding, and arched windows lend beauty and elegance to this french country style house plan. This open concept living area from the great room and kitchen will mean you never have to miss out on family time. The kitchen features amenities such as a walk-in pantry, large island with seating and an attached breakfast room. The visual elegance of this house continues into the master suite which displays a vaulted ceiling and large windows looking out to the rear of the home. 2 additional bedrooms are located on the other side of the house and feature a Jack and Jill bath between them. Garage space is certainly not an issue with a 2 car garage and separate single car garage along with plenty of additional room for storage. If an additional room is needed the optional bonus above the garage has an large space with a bathroom.